I am curled up in my hoodie right now, and Smallhausen asked me why I was wearing my coat indoors. 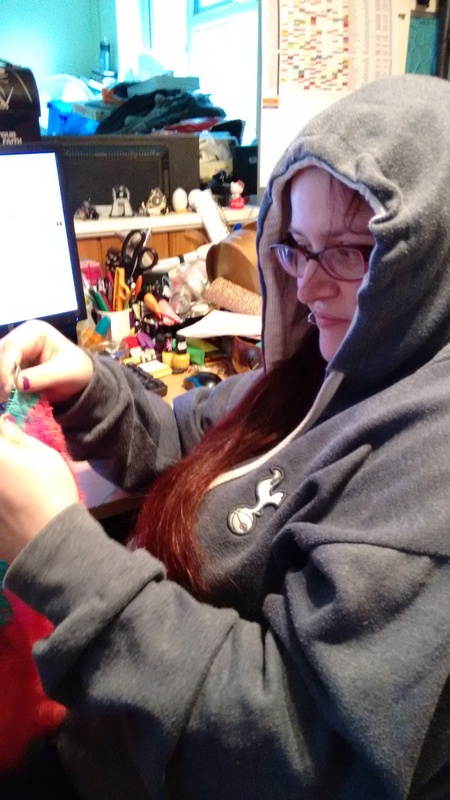 So I thought it would be funny to get her to take a picture of me in my hoodie knitting. She doesn’t really have the basics of taking photos mastered (or even apprenticed) yet, so I’m just happy there was one out of the many that was sort of workable for this post. Let’s see, today was full of excitement. The trampoline we ordered came in, and Z got it made up most of the way before he fetched Smallhausen home. Both of the girls had a great time testing it out, and I got to make it creak ominously myself for a few minutes. I spent most of today with Littlerbit barnacled to me. I’d written that into my ‘schedule’, because I thought that both of us were going to want/need it. It was nice! I did get done the few things I wanted to do, and otherwise had lots of one on one with my not-so-tiny one. Sneef. We also got Littler’s school jumpers, so she gets to start school tomorrow appropriately attired. Z let her try one on, and she sobbed when he took it off and I wouldn’t put it back on her. She’s so freaking excited to be starting school, it’s adorable. Z is running a few errands and working from home so we can both be there to pick her up. I expect that we are going to have an overwrought bag of sobs when we get her home tomorrow, but that’s okay. I’ll take it as a sign that she had the full-out fun she has told me she is planning on getting up to. Right, I’m going to get back to the knitting.